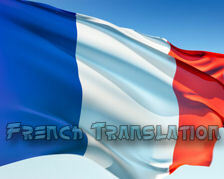 Translation is the necessity for today’s world and we are providing the French translation in its best possible way. We employ only the very best French translators the world has to offer. They are meticulously screened during our rigorous selection process so that only specialists having the best qualification, industry experience and subject expertise handle your translations. We only work with dependable and experienced translators who consistently display superior performance and quality results. We ensure that the French translators assigned to your project have the appropriate expertise required to provide you with a high quality, culturally sensitive translation in any field that you desire. French Translation Fields: Document Translation ( IT Manual, Software Manual, Multilingual User Manual, Technical Script and Manual, Training Material, Medical Documents, Engineering Documents, Marketing & Advertising, Legal Documents, Literatures, Official Papers, Tourism, Sports), Website Translation, Software Localization, Multilingual Web Publications, Web Content management and translation, Print Publications. French (français) today is spoken around the world by 65 to 80 million people as a native language, and by about 190 to 200 million people as a second or third language, with significant speakers in 54 countries. Most native speakers of the language live in France, where the language originated. Most of the rest live in Canada, Belgium, Switzerland, Francophone Africa, Luxembourg, Monaco, or in the United States. It is an official language in 29 countries, most of which form what is called in French La Francophonie, the community of French-speaking nations. It is an official language of all United Nations agencies and a large number of international organizations. According to the European Union, 129 million (26% of the 497,198,740) people in 27 member states speak French, of which 59 million (12%) speak it natively and 69 million (14%) claim to speak it as a second language, which makes it the third most spoken second language in the Union, after English and German respectively. French has official status in the Indian Union Territory of Pondicherry, along with the regional language Tamil and some students of Tamil Nadu may opt French as their third or fourth language (usually behind English, Tamil, Hindi). Kolkata Translators - French Content Writing India - French Language Professionals Kolkata.